If you live in a rural area, you most likely have a stand-alone septic system that's not connected to a city sewer. With proper care, which includes regular cleaning, your septic system is designed to operate properly and last for years. 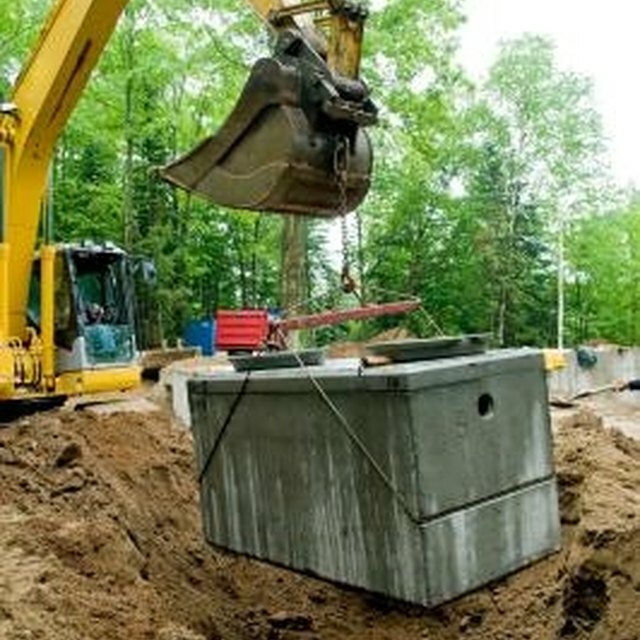 Sometimes, though, your septic tank can become backed up. There are common signs and tests that will tell you when that happens. Run water down a drain in your house. If the water is either slow in running out or it doesn't run out at all, there may be a clog in that drain. Check other drains on the lower levels to see if they work properly. If all the drains have a similar problem, it's possible your septic tank is backed up. Flush the toilet in the lowest level of your house. If the toilet backs up for no apparent reason, that may be a sign your septic tank is backed up. Flush other toilets in the lower levels. If they don't flush properly either, that's a possible sign your septic tank is at fault. Visually inspect the area in your yard where your septic system is installed. Don't limit your inspection to the area directly over the tank. Your entire septic system covers a wide area. It contains one or more distribution box(es), several lines and an absorption field. Look for wet or squishy spots in your yard, especially gray or black water or spots that smell like waste. These are telltale signs that your septic tank may be backed up. Run a plumbing snake down a toilet or a drain to check the main line between your house and the septic tank. It may be clogged because of tree roots, a broken line, or solid wastes that shouldn't have been flushed down the toilet. If the snake clears the line, your septic tank isn't backed up. Hire a septic tank professional. He or she can open up the riser lid on your septic tank and use a special stick to measure the amount of scum and sludge. If the distance from the bottom of the scum is 12 inches or less from the top of the sludge, you'll need to have your septic tank cleaned out. If your septic tank doesn't have a riser or other access, you'll need to hire a contractor with a backhoe to uncover it first. Have a riser installed so your septic tank will be more accessible in the future. How often your septic tank needs to be cleaned out depends on the size of your tank and how many people live in your house. Try to avoid driving vehicles over the area of your yard where the septic system is located. The weight can crush or break the sewage lines. Avoid planting trees or shrubs near the septic system. The roots can clog your system. Don't flush items such as disposable diapers, condoms, feminine products, paper towels, cooking oil/grease and coffee grounds down your toilet. These can easily clog your septic tank and cause it to become backed up.